SAO PAULO, Brazil — Coffee prices remained stable Brazil in January (Dec. 28 2018 – Jan. 31 2019), but the average monthly prices last month were lower than in December/18, reports Cepea in its latest report. Between Jan. 2 and 31, the CEPEA/ESALQ Index for arabica coffee type 6 (delivered in São Paulo) averaged 410.87 BRL per 60-kilo bag, 2.08% down compared to that on December/2018. As for robusta, the CEPEA/ESALQ Index for the robusta type 6, screen 13, Espírito Santo State, averaged 304.21 BRL per 60-kilo bag, 1.7% down in the same comparison. For both varieties, these are the lowest monthly price averages since January 2014. This scenario reflects the large output in the 2018/19 season, despite the expectations for lower inventories at the end of the 2019/20 crop, in June 2020. While production should decrease between 11 and 18%, to 50.4 – 54.4 million bags in 2019/20 (according to data from Conab released in January), consumption may keep increasing in Brazil, surpassing the 23.2 million bags estimated for this crop by the USDA in Dec/18. As Brazilian coffee exports should continue high, possibly reaching a new record in 2019, at 37 million bags (according to Cecafé, Coffee Exporters Council), at the end of the 2019/20 crop, inventories should return to the levels observed in 2017/18: between 2 and 4 million bags. It is worth to mention that the estimates for ending stocks are not accurate and still depend on the possible negative effects of the drier and warmer weather during the beans-filling stage (Jan. to Mar.) in the 2019 production. As for prices, agents still believe that they will be similar to those in the current crop, due to the possible record production for a year of negative biennial cycle at arabica crops. 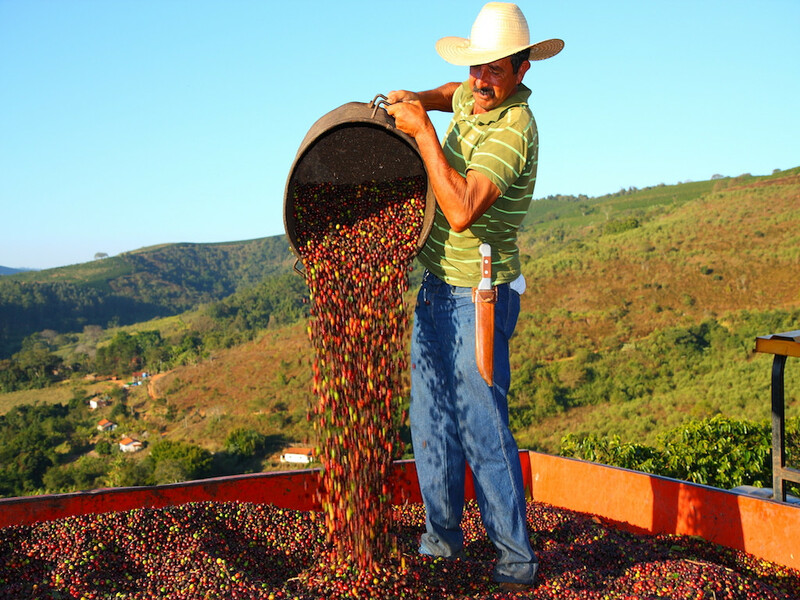 Lower quotes may be expected for robusta, whose production may hit a new record in 2019/20. After a record 2018/19 crop, the Brazilian coffee sector expects a satisfactory output in the 2019/20 season, considering the negative biennial cycle at arabica coffee crops. Conab’s (National Company for Food Supply) first estimates, released on January 17, show that the 2019/20 output may total from 50.4 to 54.4 million 60-kilo bags (arabica and robusta). Although these figures are still lower (11.6% – 18.1%) than those from the current season, the volume expected for 2019/20 would be a new record for a year of negative biennial cycle. Conab’s surveys are also within the expected by the agents consulted by Cepea, who believe the 2019/20 crop will reach from 50 to 55 million bags. The main reasons for a positive output are the favorable weather since blossoming (which increased crops potential) and the optimization of crops management. As for arabica, Conab expects the harvesting to reach from 36.1 to 38.1 million bags in the 2019/20 crop, against 47.4 million bags in 2018/19 – 23.9% and 19.6% down. Robusta production, however, should increase from 1.3% to 15.2%, reaching 14.3 – 16.3 million coffee bags. According to Cepea collaborators, while the arabica volume should be similar to the minimum stablished by Conab, robusta crops tend to be slightly larger this year, and agents forecast the harvesting to total between 15 and 18 million bags.